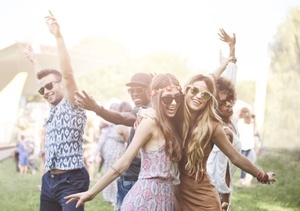 Festival season is upon us and music-lovers up and down the country are preparing their favourite outfits and packing plenty of glitter and sequins for the occasion. But are you preparing to help protect your skin from possible sun damage? It doesn’t have to be a sunny day for you to burn as UV rays can be strong even on cloudy days. As you’ll be outside for the majority of the time, it’s extremely important to help protect your skin from sun damage – after all, you don’t have to deliberately ‘sunbathe’ to burn. And as sunburn can leave your skin sore and tender, it can ruin your festival experience. Being exposed to UV rays for an extended period whilst you’re dancing the day away can be harmful, as too much UV radiation can damage your skin which can increase your likelihood of developing cancer, so it’s vital to help protect your skin from this damage. Apply sunscreen. Sunscreens play an important role in helping to protect your skin against the sun’s potentially harmful UV rays. 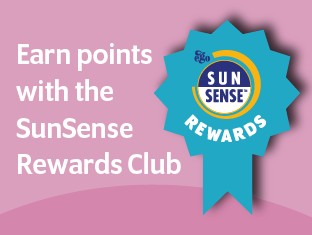 We recommend wearing an SPF50+ sunscreen to give yourself maximum protection, such as SunSense Ultra SPF50+ which comes in a handy 50ml roll-on – perfect to pop in your festival bag without taking up too much space! It is also important to reapply at least every two hours, and after sweating. Protect your face too by applying a SPF 50+ facial, such as SunSense Daily Face, which you can apply under make-up. Wear appropriate clothing. We understand that summer festival-goers won’t want to completely cover up, however, there are still pieces you can wear that will be suitable for the occasion whilst helping to protect your skin from the sun. A wide-brimmed hat is great for protecting the head and face from UV rays whilst loose-fitting clothing with a close weave will help to block UV rays from your skin. Seek shade where possible. Make the most of the sheltered stages at festivals to provide some relief from the sun and seek shade and protect your skin from the sun’s UV rays. This is a great way to protect your skin from sun damage. It is important to stay hydrated and carry plenty of water with you.